Over the years in boxing, there have been successful pairs of brothers to have great careers and win world titles. There were the Spinks Brothers: Michael and Leon, The Bredhals: Jimmy and Johnny and more recently the “Brothers” Klitschko. There were also another pair of brothers in the 1990’s who found success in the prize ring while experiencing the highest of highs and lowest of lows. They were the Ruelas brothers: Gabriel and Rafael. Gabriel Ruelas was a young champion on the rise before tragedy struck one spring night in 1995, which had an everlasting effect on his career going forward. Ruelas was born in Jalisco, Mexico and raised in Southern California. One day in 1982, he and his brother Rafael came across a boxing gym and the both of them took up the sport. Ruelas had an amatuer career of 53-3 and would turn pro in 1988. An exciting come-forward fighter who loved to give and take inside the ring, Ruelas would win his first 21 fights, 12 by KO. On 04/14/90, Ruelas faced off with Jeff Franklin and would suffer a terrible elbow injury during a clinch in the seventh round, causing the fight to be stopped. The injury would sidline Ruelas for over a year. He returned to the ring in June of 1991 and would win his next 12 bouts before facing the legendary super featherweight champion Azumah Nelson on 02/20/93 in Mexico City, Mexico. Ruelas fought hard and gave the “Professor” a run for his money in losing a very close majority decison. Ruelas rebounded well from the loss and would win his next six bouts all by KO before getting another crack at a world title, this time against super featherweight champion Jesse James Leija. They met on 09/17/94 in Las Vegas. It was an exciting back and forth fight in which Ruelas tasted the canvas once and Leija tasting the canvas twice. The end result would be an unanimous decision win for Ruelas. He was now a world champion. He would defend his title once before the night of 05/06/95 when he faced Columbian challenger Jimmy Garcia. The fight took place at the outdoor arena at Caesars Palace in Las Vegas and it was the co-feature on a big Pay Per View card which featured his brother Rafael in the main event against Oscar De La Hoya. Ruelas was dominate throughout the fight, punishing the Columbian challenger before the fight was finally stopped in the 11th. Garcia then collapsed inside the ring after the fight and had to be taken to the hospital. He died nine days later. Ruelas was devastated by the tragedy, in disbelief that another man died by his hands. He returned to the ring just seven months later, facing Azumah Nelson in a rematch. Ruelas, who was still recovering from the tragedy of the Garcia fight was destroyed in give rounds. He would fight three more times in 1996 and 1997 before getting another title shot against the exciting and hard hitting Arturo Gatti. They met on 10/04/97 in Atlantic City. The fight was the co-feature on the Lennox Lewis vs Andrew Golota undercard. It was a war from the opening bell with both fighters exchanging furious punches. Ruelas rocked Gatti in both the fourth and fifth rounds and was very close to taking Gatti out before getting caught with huge left hook that put Ruelas down, ending the fight. 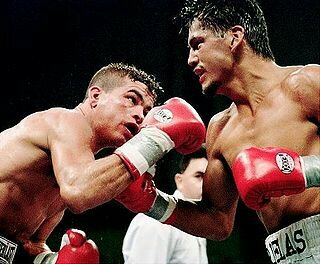 It was a spritied effort by Ruelas and the fight was voted as 1997’s fight of the year. It would be Ruelas’ last shot at a world title. He would go 5-3 from 1998-2003 before hanging them up for good. His record as a professional stands at 49-7 with 24 KO’s. It’s interesting to imagine how his career would have been had that tragedy on 05/06/95 not have happened. It’s another one of those stories of “what could have been”. In the end it was a great career filled with a lot of great memories and excitement for boxing fans.